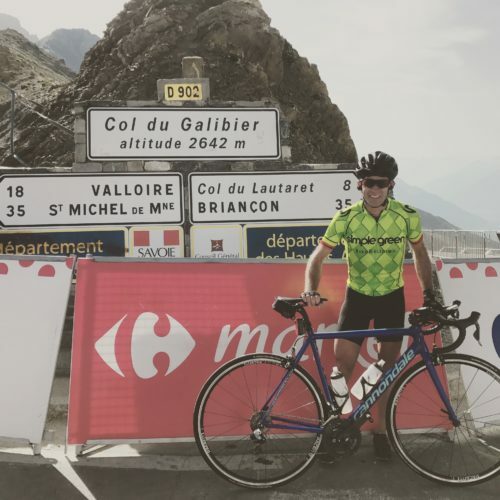 The one mountain that I probably remember hearing the most over the years while watching the Tour de France was the Col du Galibier. Not only is often featured, but tends to be the highest points in most Tours. It’s usually included in stages that finish up the Alpe du’Huez, This years, it was part Stage 17 into Serre-Chevalier. 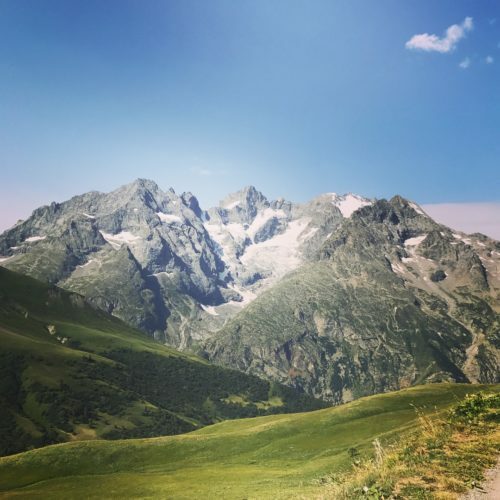 Our tour group already had a place staked out at the stage finish, so this allowed us to ride up the Galibier and get down before the finish. The 2017 Tour went up from the Col du Telegraphe and down towards the Col du Lautaret. Most of the spectators would be lined up on the Telegraphe side to watch the climb. If we did this, we wouldn’t make it down to the finish. To complicate matters, the French president, Emmanuel Macron, was going to be watching from a race vehicle. Yep, let’s get up and down. We started from our bus in Serre-Chevaliar, and took a pretty easy pace along the valley road. There were tons of cyclists headed up to watch the race, so we pretty much owned the road despite all of the race vehicles. I had an interesting chat with a Frenchman along the way about Americans from the Armstrong era vs Brits in the Wiggins/Froome era. He basically said we were the nicer/better fans. The climb to the Lautaret isn’t that hard. The road to the Galibier was closed to vehicles, so it was a pleasant climb. I didn’t think it was too bad, but I felt the altitude towards the end. My legs were also still pretty tired from the Col d’Izorad yesterday. I’m glad I didn’t push the pace. At the top, there was a group of folks from Trek Travel. Some of them had been to Waterloo, which was funny having grown up in nearby Marshall. After a few quick photos at the top, it was time to get down, change, and watch the finish. Our tour group was stationed at a hotel with a direct view of the finish. We were able to get onto the roof for a great vantage point. It is still surreal to watch the Tour in person after having watched it on TV so much over the years. Overall, a pretty memorable day. Next Post: How Many Hors Catégories Can I Fit Into This Trip?